it was supposed to be just a short trip, a much needed break from Maria Schaunitzer’s daily grind as a journalist for an Austrian publication. 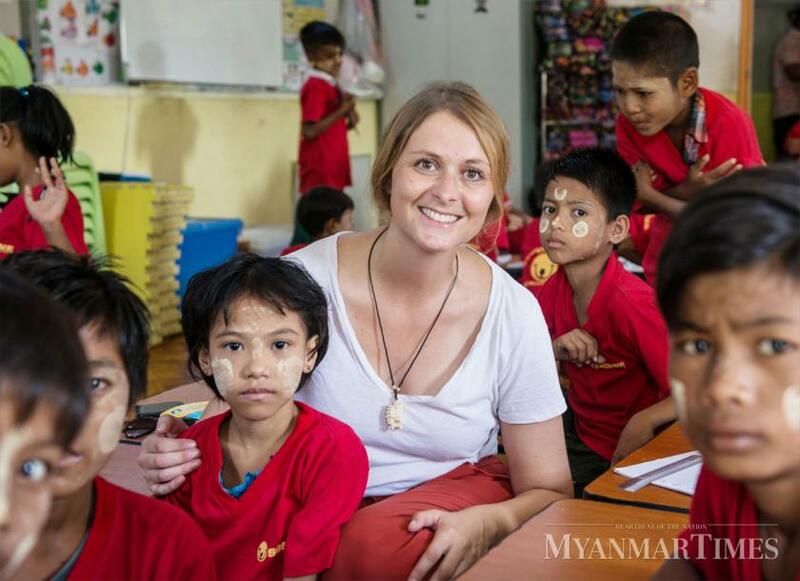 During her break in 2016, Schaunitzer chose to volunteer for the development organisation Sonne International’s local in Myanmar SONNE Social Organisation (SSO). But in her short two-month stay in the city once considered the garden city of the east, she fell in love with the people of Myanmar, their friendly and unassuming ways and their diverse cultures, which she found fascinating. When she left she also missed the children, their smiles and carefree ways – things only children do – despite the dire situation they found themselves in. The memories of the country and its people left a gaping hole in her heart and so when she found out earlier in the year that Sonne needs a representative in Myanmar, she grabbed the opportunity without hesitation and took a leave again from her journalism work, this time for one year. Schaunitzer says that she felt as if she never left upon returning to Sonne Social Organisation. The staff, children and parents welcomed her back with open arms. This time, Schaunitzer is working as the organisation’s development and networking officer and her time here will not only be occupied by the friendly people of Yangon and exploring the colorful city but also helping in alleviating the plight of street children. The vacationing journalist admitted that she is a bit of a stranger to her new job, but noted that her skills in dealing with people as a journalist helps her a lot in her work. “It’s never easy, when you start a job in a new field and especially in a new country. But working for an NGO and writing have some things in common: it’s all about the people and talking a closer look at their lives. And I always liked this,” she said. Schaunitzer is thankful that the local staff are very efficient and capable as they assist her greatly in her duties such as finding new ideas on how to make their projects more responsive and effective. “At the moment we are trying to implement a little garden project in the slum areas next to our day care centers because we also care about the whole community, not only the children,” she said, adding that they are getting the support of the residents in the area. Schaunitzer expressed hope that through the projects SSO will be able to improve the lives of the street children. “Our goal is to give these most vulnerable children and young people perspectives and a chance to lead a life of dignity. And we think education is right way to do so,” she said. She is also a very pragmatic person and always believes that working with local authorities in finding solution to the problem would not only facilitate the implementation of the projects but would also improve their sustainability. But all work and no play would make one’s life unbearable, especially for foreigners in this city. During her free time Schaunitzer likes to just get lost in the city and explore. She takes buses to move around and she feel safe doing so. But Yangon is far from perfect, especially for somebody who comes from a first-world country. “Too much rubbish everywhere, too many cars and sometimes the air is really bad,” she said. But despite all this Schaunitzer remains captivated by the city, its people and their diverse cultures.